A friend of mine recently asked for some suggestions on which language she should use to learn to code. I find Python to be super fun and easy to pick up. Plus there’s tons of neat libraries available for manipulating data. One bonus: down the road, you can start playing with some of the many machine learning libraries that are available. Then you can build a model that will predict names of Android phones. I’ve played only a little bit with Swift. I like it and I think Apple is doing some good work trying to provide tools to help people learn. For now, you’re mostly going to be limited to building mobile apps, though there are more tools being built that expand its uses (e.g., servers). 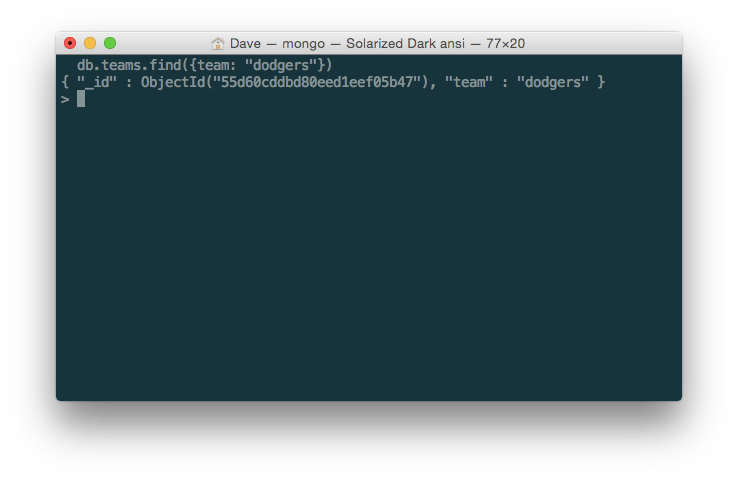 Using the Mongo CLI to find your data. We’ve been working on many projects lately that have utilized MongoDB as the primary means of database storage. I have previous experience building and using MySQL databases, so the idea of these NoSQL databases is a new concept for me. I’m not one to shy away from new technologies, so I’ve been trying to embrace MongoDB and learn how to use it. 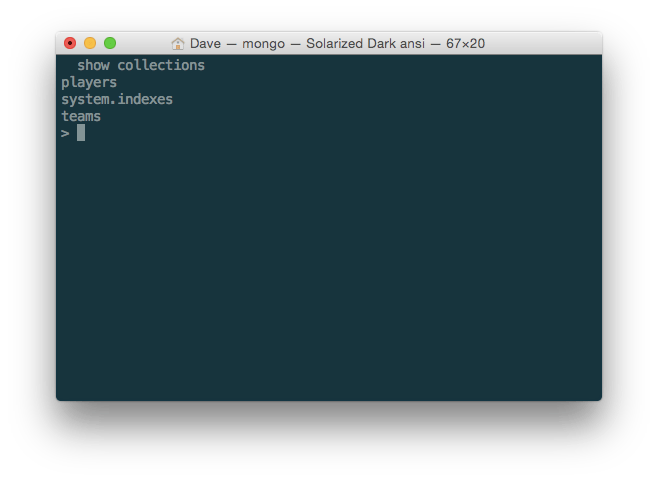 One of the most important things I’ve been learning is how to view the databases, collections, and records that I’ve saved in my various applications through the MongoDB command line interface. 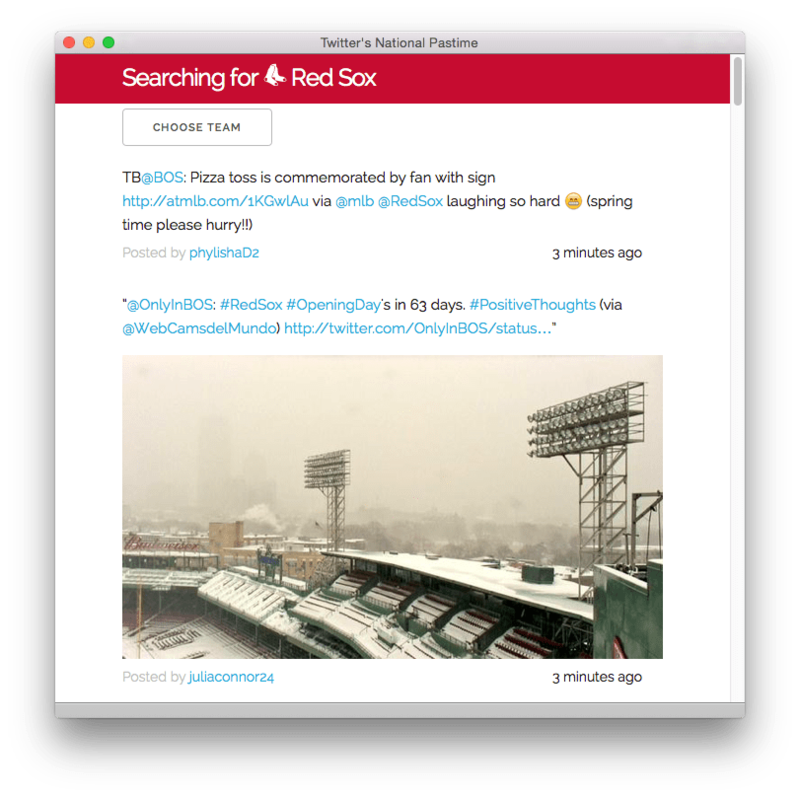 Let’s do a quick walk through and pretend I have a database dedicated to baseball. Once you have Mongo installed on your machine, you run the interface by typing mongo in your terminal. Now, you can bring up a list of databases by typing show databases. Awesome! Of course, you’ll want to do more than just “use” the database. We want to see what’s inside it. This is accomplished by telling mongo to show us all collections (e.g., think of these as “tables” in a traditional SQL database). Awesome! Now we have a collection of teams and collection of players. Well, let’s display everything within a particular collection. In this case, let’s print out all teams that we have stored in our database. Now, you can imagine that if we had more data, there are a lot more things that we could search for and find. It’s pretty powerful! 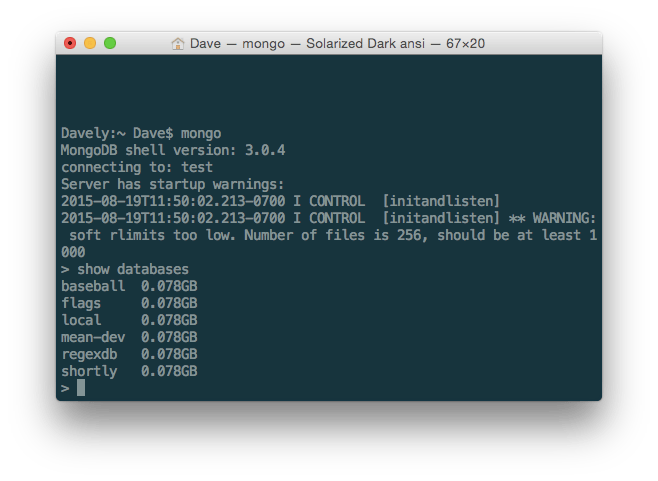 Anyway, this was a quick tutorial on how to use the Mongo DB CLI. I hope you found it helpful! I’ve been playing around with Node.js recently and taking some of the neat online lessons available through Nodeschool. One of the lessons involved streaming realtime data between the client and server using Socket.io. This sounded insanely powerful and fun, so I took a break from the rest of the lessons and started playing around with Socket.io. 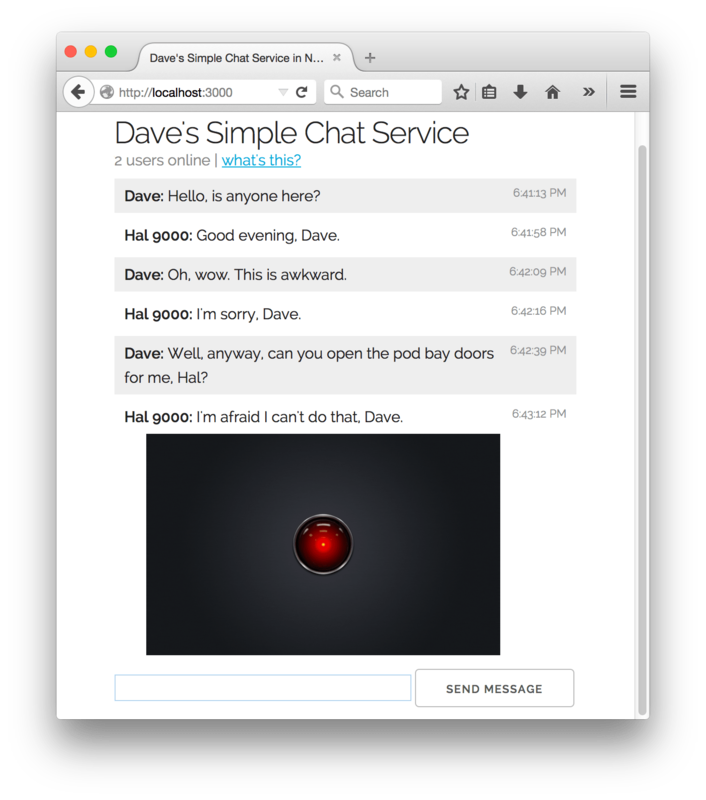 They have a tutorial that explains how to build a simple, realtime chat application using its library in about 20 minutes. Display a list of all connected users! Detect if a link to an image is pasted in and expand! All in all, it’s been a really fun learning process and has given me some ideas on how to use Node.js for future realtime applications. You can see it in action right here and the source code is available on Github. 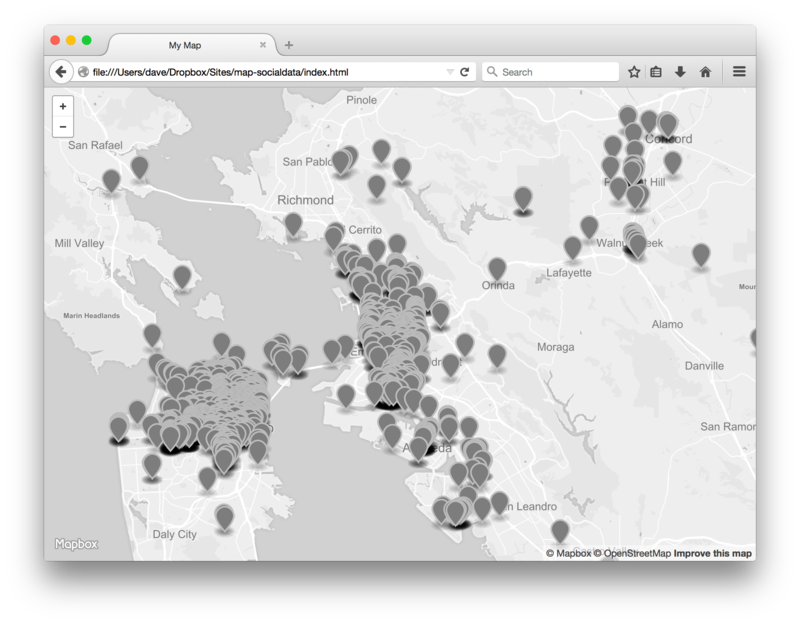 Earlier this year, I joined a group on Meetup dedicated to creating, analyzing, and talking about digital maps. It’s organized by the fine folks at #Maptime, who have an amazing enthusiasm for all things map related. It sounded like something that’s right up my alley, considering all the time I spend thinking about maps. Last night was project night. All sorts of folks were there, working on complicated issues such as transit, land use, green space, climate effects. It’s kind of inspiring! Pretty neat stuff! I have some ideas on how to improve this and some additional data that I want to show in the future. In part I, I explained how I’m attempting to write a webapp that can solve simple Sudoku puzzles. Since then, I’ve made some progress. This series will track what I’ve been working on, learning, and any difficulties I’m encountering. With a goal in mind, it was time to just dive in and go. At first, it was kind of overwhelming. Where do I even start? How the heck am I going to even tackle any of this? 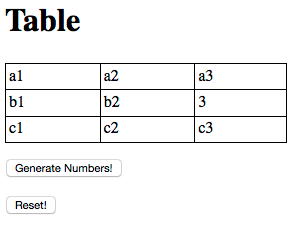 After a few tries, I had a simple project featuring a table (with cells individually labeled) up and running! After some more tinkering, I was able to get the “Generate Numbers!” button to actually randomly generate the numbers 1 through 9 and fill in the cells without repeating any numbers. Sweet! Hey, that’s kind of cool. Now we’re getting somewhere! I think I was ready to take it to the next level. 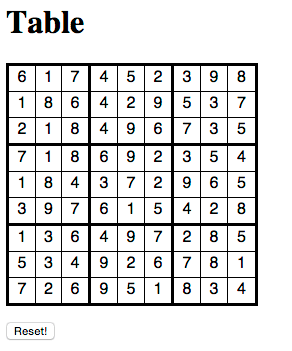 Step 2: Okay… I guess we need to make a fake Sudoku grid. 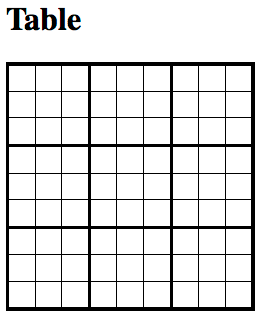 There’s probably simpler ways to go about doing this, but I ended up spending a lot of time figuring out how to build a Sudoku grid in the first place. Hey, I wanted this project to look somewhat presentable when I showed it off and (hopefully) finished it. 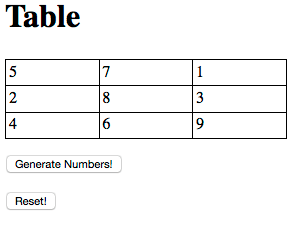 HTML tables were driving me crazy, so I just straight up stole this helpful thing after Googling for an answer. It looks pretty good. Pretty, pretty, pretty good. Alright, one mission accomplished. Now onto another mission. How do I completely fill out the entire grid? I started with this, because I wanted to understand how to try to isolate certain sections of the Sudoku grid and see if I could create a series of non-duplicated random numbers. Why did I start with randomly generating numbers? I initially thought I would just try to brute force solve some simple beginner’s level puzzles, but I later realized how ridiculous this would be. There’s a ridiculous number of possible permutations to try. For now though, I decided to start filling out random numbers by row. 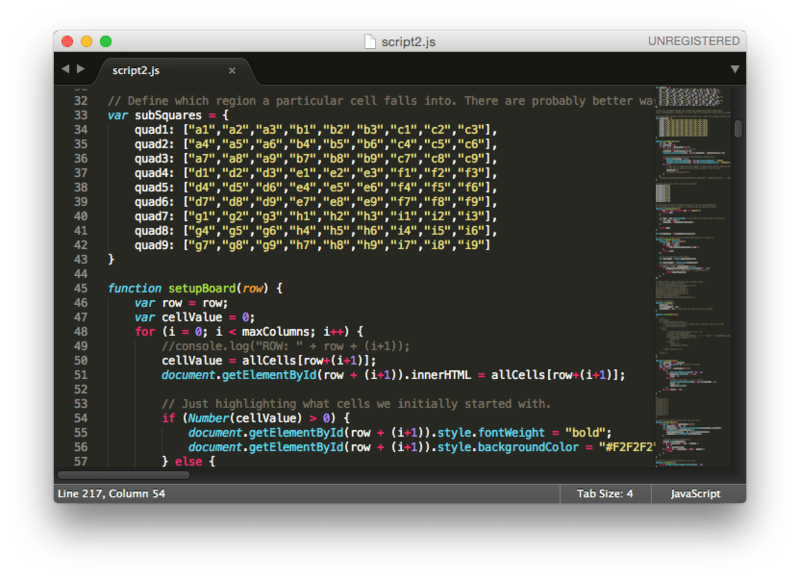 This is what my initial code looked like. Did it work? Yes! I ended up with grid of random numbers filled out! Sure, there’s really no rhyme or reason for where numbers ended up, but it certainly looks like a completed Sudoku puzzle, right? Alright, entering a bunch of random numbers into a grid is pretty fun for all of 5 minutes. (To be honest, it was pretty fun) But to take this to the next level, I really needed to have the beginning of a Sudoku puzzle in there. A few quick Google searches later, and I found a suitable candidate! One thing I decided early on was to store all this data in an object — mostly so I could easily update it with different puzzles later on. It ended up looking like this. i1: 7, i2: "", i3: 9, i4: 4, i5: "", i6: 2, i7: "", i8: 8, i9: ""
On top of this, I wanted to easily differentiate the initial numbers that were created on a brand new board (so I could easily see what my script was generating, versus what was already in place on the board). I wrote a function to modify the DOM and change the font weight and background color of the starting cells. // Just highlighting what cells we initially started with. You’ll notice I have a lot of console.log() calls commented out. I liberally used these all over the place so I could make sure things were working correctly. Anyway, once all that was said and done, it ended up generating a board that looked like this. Wow, we’re starting to chug along pretty nicely! Next time, I’ll talk about the million different functions I created in trying to solve this. This series of posts will track what I’ve been working on, new things I’ve been learning, and any difficulties I’m encountering along the way. Buckle up! One of the things I resolved to do this year was spend a bit more time learning to code. Sure, sure, I’ve dabbled in things like PHP and have used MySQL to build some pretty basic websites and tools. Even with the little I’ve done, I’ve always enjoyed it and have found myself losing track of time while trying to solve some problem or just get this certain thing to work. It reminds me of a similar thing I’ve encountered with the addictive nature of Sid Meier’s Civilization games. Late last year, I mentioned to a coworker my desire to spend a bit more time learning various techniques and theory. He suggested that if I’m serious, I should really just start trying to tackle some problems and we could go over it together. The first thing he suggested? 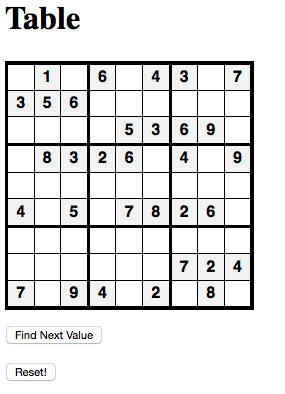 I should build a application to solve a Sudoku puzzle. So, that’s what I’ve been doing the last few weeks. Between taking some awesome online courses through Codecademy and Udemy, as well as reading up on various books, I’ve been trying to really get into it. How am I doing? I’ll try to share my progress in future updates. Our office has an empty TV that isn’t being properly utilized at the moment. It’s definitely a #FirstWorldProblem, but it basically boils down to the fact that we have multiple displays that act as dashboards for our various services and properties. Anyway, we had a spare television available to show whatever we wanted. THE ENTIRE INTERNET WAS OUR OYSTER and what better way to put it to use than to display a random assortment of animated GIFs. Our troubles arose when we realized we had to manually change out the animated GIFs, as well as zoom in in via the attached machine’s web browser so that it would properly display images. We’re using CSS to set a background image (based on one of our animated GIFs) that fills up the entire display. Depending on the settings of your viewport, the image has the possibility of being severly cropped, but hey, whatever! Upload this script to your favorite web server that supports PHP. Drop images (of the animated GIF variety) into the /images folder. Open up this page in your favorite browser on your favorite device. Cool? Cool! So, what the heck does this thing look like? You can see it in action right here. (Make sure to set your browser to full screen presentation mode so you get the right effect). Soft ‘g’ or hard ‘g’? Hard G, dudes. It’s JIFF! I’m not wrong. You’re wrong. Thanks to a few people who helped me try and figure this out. You can download the source code for GIFtv on Github. Get email address from the list of winners. Write up some sort of email template. Go through and copy paste template into new email, and then copy and past the email address from list of winners. Oh, this particular giveaway features a unique code for each winner. Make sure you copy and paste that, too! After all this copy and pasting, send the email. Repeat this process until you’ve gone through the list of winners. Look at a clock and realize this has taken all afternoon. There is! Just download this project to your favorite PHP compatible server (or run an app like MAMP on your machine) and open up the “make_email.php” script. emails.txt – This is the list of email addresses you wish to send emails to. Each email address should be on a new line. No commas or funny stuff separating them, please. I didn’t build in any sort of fancy error checking. body.txt – This is the meat and potatoes. This is the message you’re going to want to send over and over and over and over. Sweet! One particularly important note: If there is some sort of unique redemption code or URL that winners will need to go to, you can add in ‘%code%’ (without quotes) to your email. The script will then automatically fill in unique codes when it generates the email (should you choose that options). codes.txt – If you have a whole list of redemption codes or URLs, this is where you put them. Like emails, each code or URL needs to be on a separate line. That’s it! You might be wondering how you set the subject line of the email. Right now, it’s a variable at the top of the script. Just change that and you’ll be good to go! Once you have these text files filled out, run the script, choose whether you’re generating emails with or without redemption codes and then fire away! You can now click through the list and start firing off emails like you’re your own spambot. Except you’re giving people legitimately cool things. And you’ll still be able to enjoy your afternoon. If you’re interested in checking it out, you can download the source code on Github.